David Byrne came to town the other day to talk about cycling and do his slideshow. It was fun. He rides his bike in cities he visits and photographs the infrastructure or lack there of. The story was roughly his personal survey of the world’s urban cycling facilities without any of the pretension you might expect from a personal survey like that. He showed termite mounds and skyscrapers, empty parking lots and highway overpasses. He was a goof without being flippant. Friend and neighbor Sandy Zipp also spoke. He gave a brief history of the bicycle in the American city through a series of photos of our town and various cultural ephemera from the turn of the 19th century and on into the early years of the 20th. Only, his presentation didn’t make a lot of sense to me. It crossed the line from optimism into self-congratulatory. Our city’s infrastructure is meagre at best. The two big waterfront paths don’t extend into the city. The largest plank of the cycling plan is a series of signs attached to telephone poles which mark heavily trafficked throughways as bicycle routes (these are the streets the new Google Maps bicycle feature prefers). Of the three striped bicycle lanes, one runs on an industrial straightaway along the shore. The pavement is as good as the surface of the moon and full of glass; drivers race from light to light and on and off the two expressway ramps; and the road is mainly trafficked by very heavy trucks. I will ride a lot of not-great-for-cycling places, but I won’t ride on this lane. On the flip side, when I asked him about the overpass path slated to be rebuilt, someone in the audience answered to say he’d spoken with the engineers and they’d said they would try their best to keep it open while the work was being done. So, fingers crossed there. P.S. Whenever these events happen, people invariably come out who never ride their bikes in town otherwise. Please don’t take that to be an I’m-a-more-die-hard-cyclist-than-you kind of jibe. It isn’t. I just like seeing techy stuff on the street and this is the time to see it. 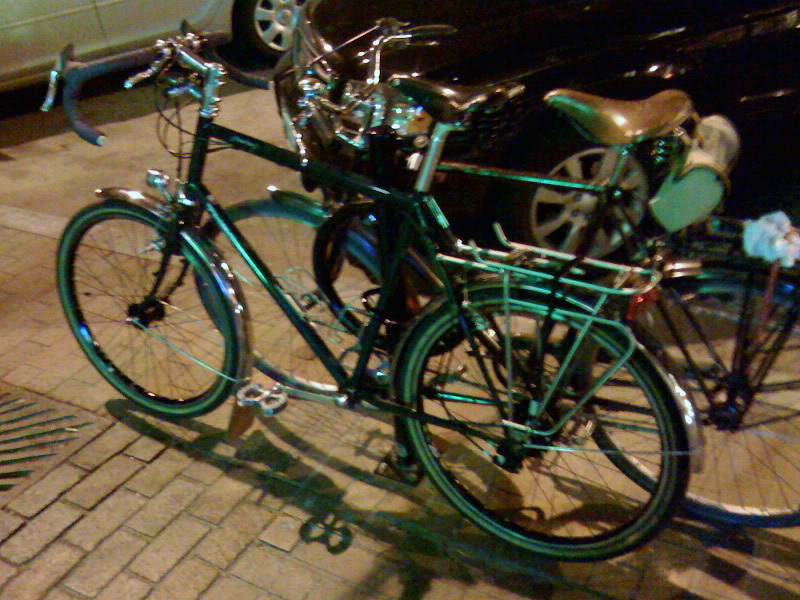 Like this guy’s bike above (terrible picture): Rohloff hub, Edelux head lamp, stainless Tubus rack. Lovely stuff! But this is not a bike which gets locked up on the street every day.